Buddy the Elf is a fan of revolving doors, and for a while, so was Jeff Klein. While his project My Jerusalem was making music with a rotating group of musicians, the frontman longed to make it a full-fledged band. This year he made it happen, enlisting band of brothers Grant Van Amburgh on drums, Kyle Robarge on bass, and Jon Merz on guitar, keys and horns. The band is currently touring (with The Sounds) in support of their album A Little Death. The results so far as as happy as an elf in tights. Geez, enough of the misguided Elf references, Jon. Anyway, all you need to know is My Jerusalem's new album is a hybrid of classic rock and current rock (yes it exists - just look beyond terrestrial radio.) The result is rocking music with honest and sometimes dark lyrics. Their A-Sides session earlier this month at the Music Conservatory of Westchester in White Plains is one of my favorites of the year. The songs matter. The interview is fun. The dudes rock. Keep Calm and My Jerusalem. Earlier this month, Hennessy V.S.O.P Privilége hosted a fundraiser to benefit NY Giants star Victor Cruz's Foundation. The event featured a cook-off using recipes from Harlem's Dinosaur BBQ with four of his teammates Shane Vereen, Damon "Snacks" Harrison, Landon Collins and Sterling Shepard. We caught up with the Giants wide-receiver briefly and asked him about the event and The Victor Cruz Foundation in general. You're often singled out for your play on the field, but talk to me about the personal benefits you get from your foundation. The personal benefits are the impacts I am able to make in my community. This platforms allows me to use relationships and resources for the betterment and advancement of younger generations. My Foundation focuses on implementing STEM (science, technology, engineering, and math) curriculum into after-school programs. My goal is to inspire and engage our nation's future scientists. 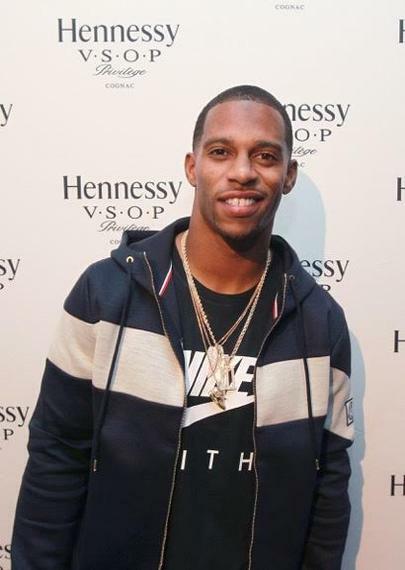 We know that Hennessy has a long history of supporting, participating and investing in non-profit, multicultural communities and organizations including the NAACP, Thurgood Marshall Fund and now the Victor Cruz Foundation. This particular event featured a cook-off with you and your teammates. How'd that come about? The Tailgate Face Off event came about through a brainstorm my Foundation team had. We like our fundraising events to be active and fun, steering away from the norm. After flushing around some concepts that would be fun, we decided to go with a tailgate. We always try to incorporate celebrity talent into our events, my teammates were just the perfect fit for this type of event. I mean, I have a teammate named "Snacks" who ultimately won the cook off. The team is having a strong season thus far. Can you talk to me about how it's going so far and how your current injury is healing? My injury is healing just fine. It was a light sprain which I was able to bounce back in time for the win against Chicago. I'm really looking forward to finishing the season strong with my team and playoff action. Rae Shrummond - "Black Beatles"
Fetty Wap - "Victor Cruz"
Jay Z - "I Got the Keys"